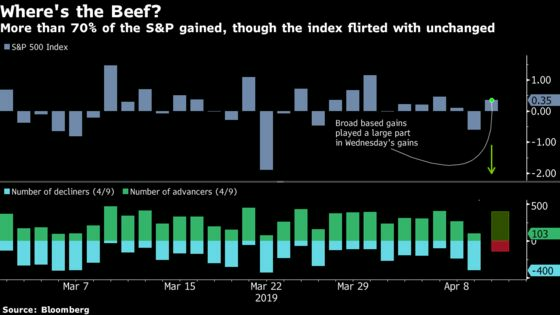 (Bloomberg) -- A lot of money was on the line on “Macro Wednesday,” as the two most important central banks unveiled their views on the world order. But with that out of the way, and the events largely devoid of wave-making (growth panic was arguably put to bed), the “Happiest Place on Earth” will put its $210 billion in market capitalization under the microscope later today (and >$6 billion worth of hedge fund ownership). The Walt Disney Company, owner of the Marvel superhero franchise that crashed ticket sales websites recently when its effectively guaranteed blockbuster, “Avengers: Endgame” became eligible for purchase, is due to put on its first investor day in 5 years later today. That same movie enthusiasm has leaked on to Wall Street too, with some of the strongest bullish sentiment in the name going back to late 2015. 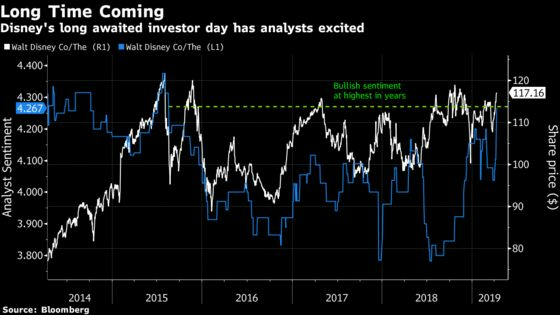 BMO in its upgrade wrote that the stock has downside protection and highlighted a potential restart of a buyback program, launches of new themed lands and the launch of Disney+ by the end of the year. The streaming service will truly be the focus of the event, as the media conglomerate seeks to push back against competitors in the content space (you also can’t forget the details concerning the Fox acquisition, which Cowen wrote was still a concern). Loop Capital estimates that the Disney+ offering may reach 9 million subscribers by the end of the first year, but is skeptical the company will provide guidance at the event today. Read a full preview here and an options-focused preview can be found here. 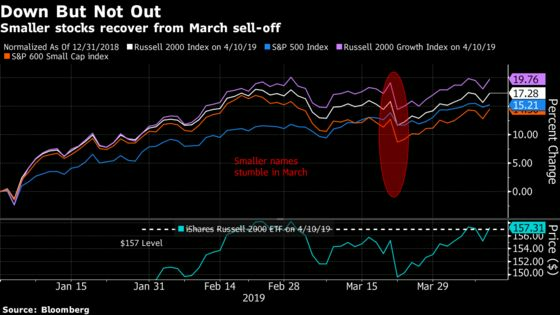 When you’re not paying attention to the mega-conglomerates, you’ll notice small cap names have again leapt out in front in performance despite the stumble in March. Breadth in Wednesday’s session lent some credibility to this, with more than 5 advancers to every 1 decliner in the Russell 2000. The S&P 500 saw much narrower disparity, with 2 advancers for every decliner, but given the small gain on the day (less than 0.4%), you can see most of the heavy lifting was conducted by the small names in the market capitalization weighted index. And it was not only the small caps, but growth names within the small caps space did well Wednesday, as the RUO Index and the S&P 600 were among the top performing sub-sectors. It will be interesting to see how sentiment forms up here, given where the IWM ETF (Russell 2000) is trading. Baird analysts in a note last week identified $157 as the level where, if exceeded, would “signal the all clear” for the market in their views. U.S. Steel received a double downgrade in the latest sign of worsening sentiment surrounding the industry bellwether. BofAML cut its view to underperform from buy, warning of “worse near-term U.S. market conditions than we anticipated.” Not only have recent price increases “not stuck,” the firm wrote, citing channel checks, but hot rolled coil has “retreated to its lows of the year.” Without a “more confident” view on prices in 2019, there are limited catalysts for the stock. BofAML affirmed its thesis that a “Steelmageddon” would materialize in 2020 and 2021, just two days after Credit Suisse issued its own downgrade and warned of a “Sheet Tsunami,” or a flood of supply hitting the market and weighing on prices. Shares of U.S. Steel are down 4.6% before the bell, putting them on track for their sixth straight negative session.